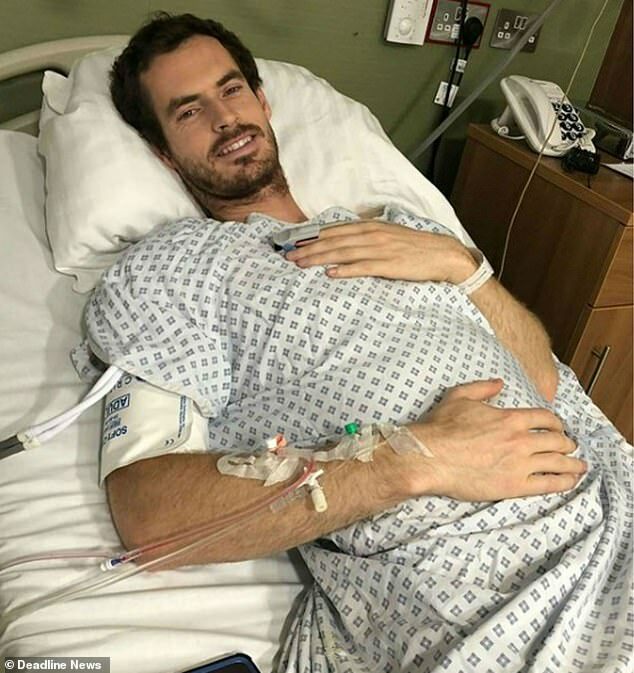 Sir Andy Murray amassed thousands of 'likes' when the tennis star posted a picture of him in a hospital bed following hip surgery on Instagram. However, now a group of specialist US doctors have revealed it is 'unlikely any of those' came from vascular access clinicians. 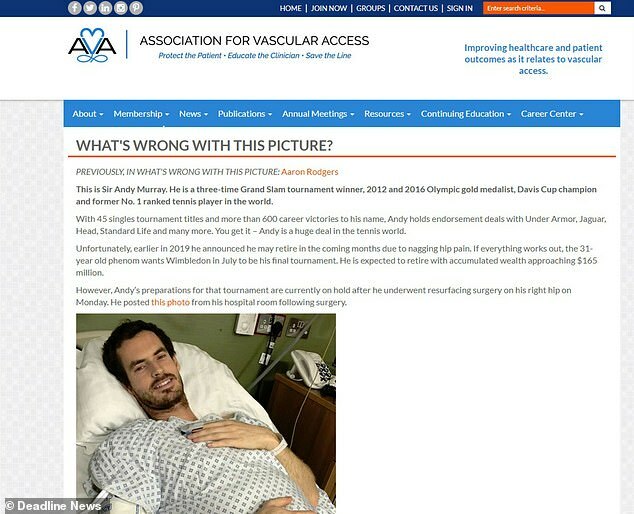 The Association for Vascular Access (AVA), based in Utah, has accused doctors of giving the former Wimbledon champion 'sub-optimal' care. In a scathing attack on Murray's care, the group annotated the 31-year-old's picture to detail what they claim are seven mistakes. They included two drips placed in his playing arm and a blood pressure cuff on the same arm as the drips. Murray posted a snap of himself recovering from a 'hip resurfacing' procedure at an undisclosed hospital in London on Tuesday. The Scot posted a picture of himself in a hospital gown with a cannula coming out of his arm and a copy of his X-ray to share the news with his fans. But eagle-eyed Instagram users were quick to point out that the scan did not just show his bones - it revealed an image of his private parts too. The AVA wrote a lengthy article on its website pointing out everything it considered 'wrong' with Murray's care. It claimed the drips should not have been placed in Murray's right arm, which he uses to play competitive tennis. The AVA added that, in any case, the blood pressure cuff should be on the 'free' arm and not the same one used for the drip. 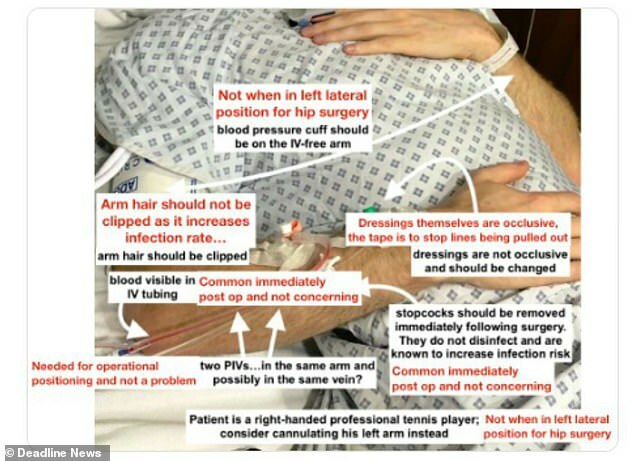 Murray's 'hairy arms' should have been clipped and blood can be seen in one of the tubes which should have been 'flushed', it claimed. While dressing and tape was not letting blood flow properly, it added. Finally, the AVA claimed stopcocks visible in the picture should have been removed 'immediately following surgery' to reduce infection risk. Vascular access refers to rapid and direct methods of introducing or removing devices or chemicals from the bloodstream, such an IV drip. After the article was shared on Twitter yesterday afternoon, it divided opinion among professionals. WHAT DOES THE US GROUP OF MEDICS CLAIM? 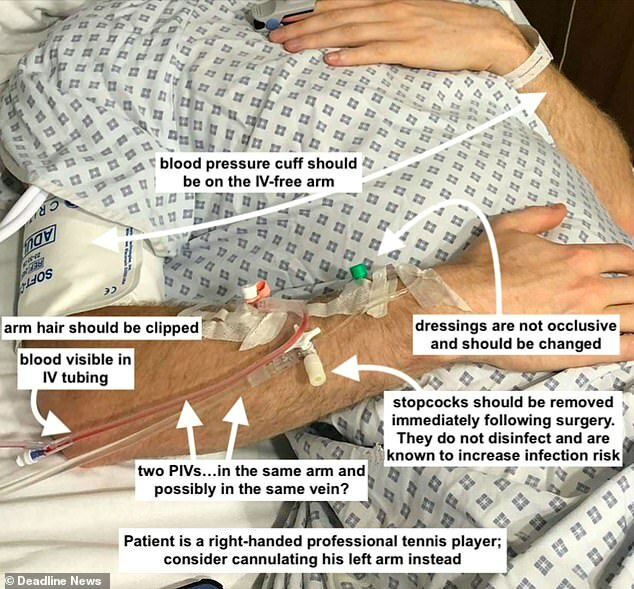 The peripheral intravenous line (PIV) - a catheter put inside his body to deliver drugs following surgery - should have been put into Murray's left arm because the Scot is right-handed. There are two PIVs going into the same vein in the 31-year-old's forearm. The AVA said it was 'not sure' why this was. The blood pressure cuff should have been placed on Murray's left arm. It could have interrupted blood flow, which can impair drug delivery and raise the risk of a blood clot. Murray's arm hair should have been clipped prior to having tubes put into his body. The AVA did not explain why his hair should have been clipped in its article posted on its website. Blood can be seen in one of Murray's cannulas, which needs to be flushed. It is also secured with tape. The AVA says 'there are better options for securing PIVs' as they get dislodged 'at an alarming rate'. Both Murray's dressings and the tape are 'clearly' not occlusive and should be changed, according to the AVA in the article posted on its website that criticises the mistakes made in Murray's care. Stopcocks - which control the flow of liquids - should be removed straight after surgery. Keeping them in for too long can raise the risk of catching an infection, the AVA claims. WHAT DOES OFFICIAL UK MEDICAL ADVICE SAY? The Royal Berkshire NHS Foundation Trust tells patients a cannula may be placed into whichever arm has the 'best vein'. Maidstone and Tunbridge Wells NHS Foundation Trust revealed its cannulation policy last year and lists 'previously cannulated veins' as an area to avoid when selecting a vein. The Rotherham NHS Foundation Trust, in guidance for a different kind of catheter, says blood pressure cuffs must not be used on the upper part of the arm in which it was placed. Guidance by Basingstoke and North Hampshire NHS Foundation Trust (BNH) agrees staff should use clippers to remove hair on a patient's arm before fitting them with a cannula. BNH guidance also says tape fixation for cannulas is 'not acceptable' and a 'recognised dressing' - thought to be a clear plaster - should be used. There was no guidance on flushing blood. Occlusive dressings are designed to be changed less. In a document about home care for wounds, The Hillingdon Hospitals NHS Foundation Trust says the original dressing should be left in place for at least two days. Mid Essex Hospital Services NHS Trust says stopcocks 'should be covered with a sterile protective cap at all times', but does not specifically mention removing them after surgery. User @akstone4094 wrote: 'Once move out of anesthesia and to the floor, cuff should placed on the arm opposite the IV. But an RAF doctor, who wished to remain the anonymous, rebuffed the association and said arm hair should not be clipped because it increases infection risk. 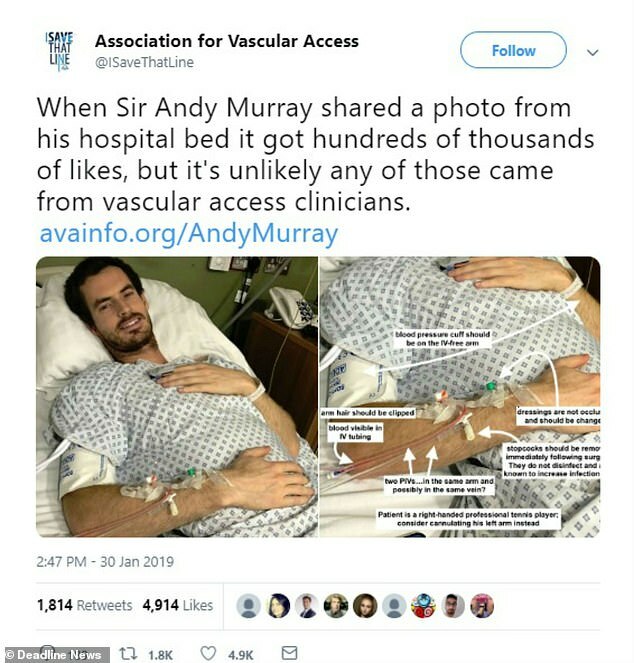 In its article, the AVA, claimed: 'Andy, a multi-millionaire and celebrity, shared photos of his PIVs and probably had no idea just how sub-optimal his vascular access care was. 'The hundreds of thousands of fans who liked the photo probably had no idea either. 'This is happening every day in hospitals and clinics everywhere, in part because vascular access is not adequately covered in nursing or medical school. 'Fifty people die every day in American hospitals because of complications resulting from their vascular access devices. WILL HIP SURGERY EXTEND MURRAY'S CAREER? Earlier this month, experts warned going under the knife would likely do nothing to keep Murray competing for longer. The Scot revealed in a tearful interview that surgery was his 'only option' if he wants to play beyond the summer tennis tournament. Before it was announced that he was to undergo hip resurfacing, experts said it suggested he had 'quite severe osteoarthritis'. Winston Kim, a consultant orthopaedic surgeon at Manchester Hip and Knee Clinic, made the claim in a piece for the NewScientist. Mr James added he would advise patients undergoing hip resurfacing never to play tennis again. Sir Andy admitted any operation would be to improve his quality of life, not his performance on Centre Court. 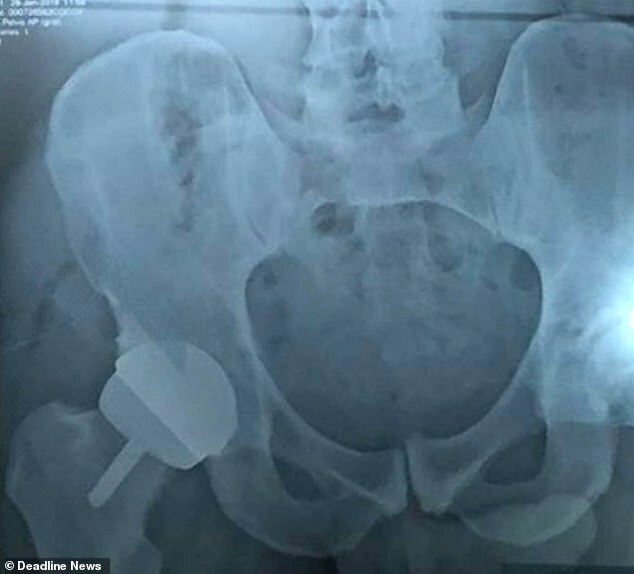 And Adam Hoad-Reddick - a hip and knee orthopaedic surgeon at BMI The Alexandra Hospital in Cheadle - added he could lose an element of 'pelvic stability and balance' if he underwent hip resurfacing. 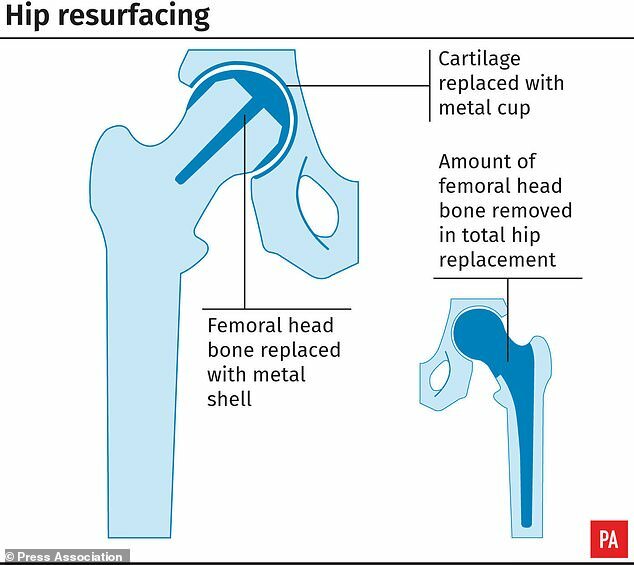 Hip resurfacing is when the femoral head - the top of the thigh - is not removed like in a traditional hip replacement but is instead trimmed and capped with a metal covering. A layer of metal is also placed in the pelvic socket, meaning metal rubs against metal rather than bone against bone. One junior doctor from Canterbury criticised the AVA's comments and said their advice could 'harm patients having surgery'. 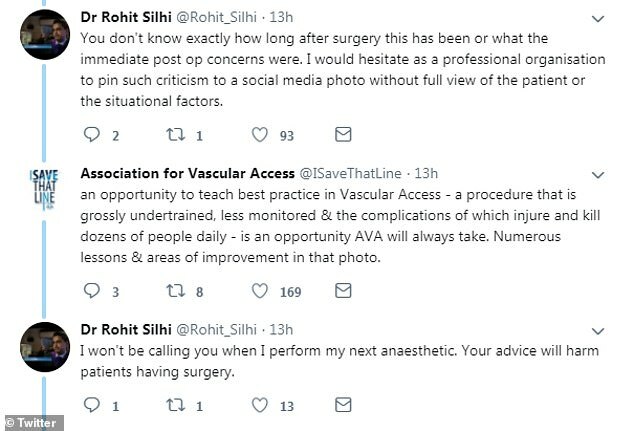 Dr Rohit Silhi tweeted: 'You don't know exactly how long after surgery this has been or what the immediate post op concerns were. Murray was debating having the procedure, which involves putting a metal plate into the joint, in a final bid to prolong his career. He confessed to being in crippling pain as he struggled to stay in his last tournament in Melbourne. He had previously said ahead of the Australian Open earlier this month that he intended to retire after this year's Wimbledon. He now faces a race against time to be fit for the championships, which start at the All-England Club on July 1. Murray's management team refused to reveal which London hospital conducted the surgery. One British medic, with 12 years' experience as an anaesthetist said the set-up on Murray's arm was 'not uncommon by any stretch of the imagination'. The unnamed person told The Telegraph: 'The stuff they are trying to suggest refers to ward-level care, which is not what he’s had done in the picture – he’s essentially just come out of theatre. 'That is what you would expect to see in recovery. The AVA said it 'thrilled' that one tweet had sparked international conversation about IV care. Chief executive Ramzy Nasrallah said: 'We appreciate both medical circumstances and context when discussing what vascular access best practice looks like. Our professional evaluation was based on one photograph posted by Mr Murray. 'Some guidance for IV care and maintenance best practice requires more context (it's been pointed out by some that he had lateral surgery on his right hip, justifying the use of his right arm for access) but there are elements to what he shared that can be addressed simply by what's in the photograph. 'The gap between what happens in the operating theatre and on the wards is not a UK phenomenon; it's a global one. 'AVA was not attacking a specialty, a person or an institution with this exercise; rather we were using a high profile and public opportunity to demonstrate how vascular access insertion, care and maintenance may be improved. Vascular access is the gateway to all healthcare delivery and the most common invasive procedure in medicine. 'Murray didn't go to the hospital just to get an IV (or two). He went to have his hip resurfaced. If something were to go wrong with his access, the entire procedure and his health could be compromised. Recovery from hip surgery takes around five months, giving him only a very slim chance of competing. Medical experts say the operation does not guarantee a full comeback. But it will allow Murray to live pain-free and it could open the door to him becoming a tennis coach after he retires. Murray was set for a farewell six months after emotionally announcing he was in too much pain to carry on in the build up to the first grand slam of the year. After losing to Roberto Bautista-Agut in the first round of the Australian Open, he said: ‘Tonight was not comfortable in terms of my hip. At the end, I’m really struggling, I can’t walk properly at all just now. But the monumental five-set tussle showed the Scot still has the ability and desire to compete at the top level, and he said he would do everything he could to keep playing. Having the surgery, which happened in London on Monday, means he might not be fit to take part in Wimbledon this summer, where he had planned to say goodbye to the sport. Sir Andy Murray turned professional in 2005, and has earned £47,887,069 (AU$84,891,060) in prize money. He has won 45 career titles with a singles match record of 663 wins and 190 losses. Became the first British player since 1977 to win a Grand Slam singles tournament in the 2012 US Open final with victory over Novak Djokovic. Murray is the first British man to win multiple Wimbledon singles titles since 1936. Won the Olympic gold medal at London 2012 and Rio 2016, making him the only player to win two Olympic singles titles. He featured in Great Britain's Davis Cup-winning team in 2015 going undefeated in 11 matches. Became world No.1 in November 2016. Won BBC Sports Personality of the Year in 2013, 2015 and 2016. Murray was named the ATP Player of the Year in 2016 and was the flagbearer for Great Britain at the Rio Olympics in the same year. He is a member of the 'Big Four' who have dominated men's tennis since 2004, alongside Roger Federer, Rafael Nadal and Novak Djokovic.